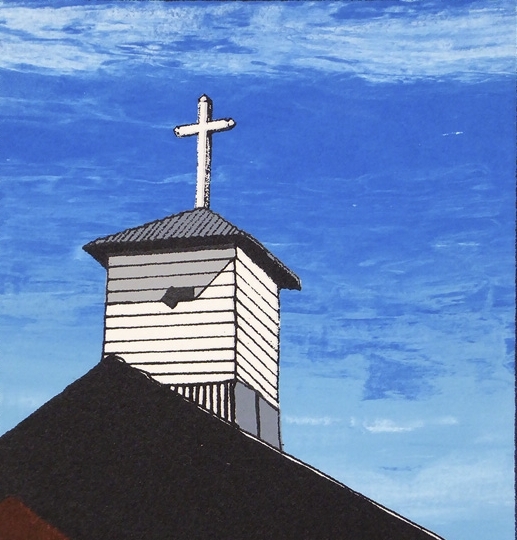 The bulk of my artistic interest and work is in printmaking, mostly serigraphy and woodblock printing. I find myself drawn to the printing arts for a variety of reasons. Printing, as a medium, satisfies my analytical side with its adherence to technical requirements, whether that be the carving of the wood, the construction of a printing screen, or the planning that goes into designing the piece. Yet, at the same time it satisfies my artistic side with the creativity of subject matter and the ability to experiment with variations in color and design. Additionally, the reproductive nature of the printing allows me to share my original works with many people at the same time. A native New Yorker, Frank has lived on the West Coast for the last three decades and in Santa Cruz County for over 20 years. He has studied with a number of local artists in a variety of media, concentrating in printmaking and bookbinding. Locally, he has exhibited at the Felix Kulpa Gallery, the Santa Cruz County Bank, the Santa Cruz Art League, the Cabrillo College Art Gallery, Artisans Gallery, and the Santa Cruz County Government Building. His work can be found in the permanent collections of the Department of Graphic Arts, Spencer Museum of Art, University of Kansas, Lawrence, KS; the New York City Public Library Print Collection, New York, NY; and the Australian Print Collection of the Wagga Wagga Regional Art Gallery, NSW, Australia. He lives in Felton. Member of the California Society of Printmakers (CSP).